A trend in journalism is generally defined by three or more happenings in the same field. 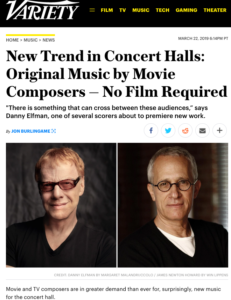 So when I discovered that James Newton Howard (The Hunger Games) had written a cello concerto, Danny Elfman (Alice in Wonderland) a violin concerto and George S. Clinton (the Austin Powers movies) another violin concerto, I thought “here’s a trend” and decided to write a story. 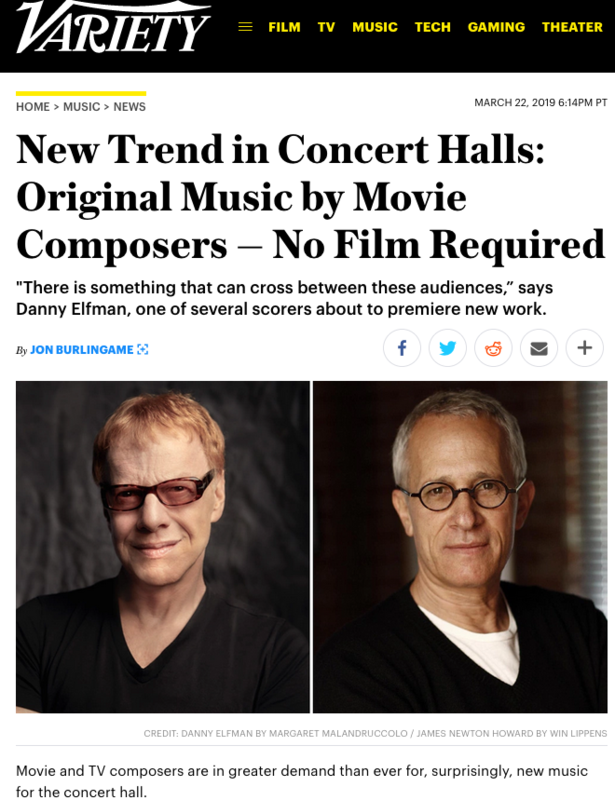 In fact, I discovered at least half a dozen concert works by composers generally known for their film music are getting premieres in the next six months — and that more than a half-dozen others had debuted in the past year, with still more on the way. 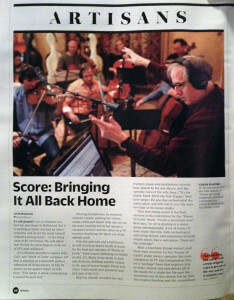 It’s not just John Williams, it’s Michael Giacchino and John Powell and Bruce Broughton and Jeff Beal and many others. Here is that story for Variety. This entry was posted in Composers, Film Music, Interviews, Television Music and tagged concert music by film composers, Danny Elfman, Elfman violin concerto, George S. Clinton, Howard cello concerto, James Newton Howard, Jeff Beal, Rose of Sonora, Variety on March 23, 2019 by Jon Burlingame. Documentary scores in the Oscar race? 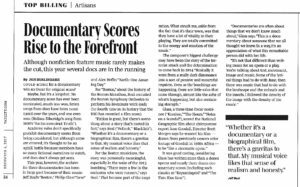 Given the number of first-rate documentary scores this year, a number of people have posed this interesting question to me: Could a documentary score win an Oscar? Could one even be nominated? (In fact, it’s only happened once, in 1975.) I interviewed a number of people about it and, in this story for one of Variety‘s awards-centric Extra Editions, offered an overview of three of this year’s best: Jeff Beal’s music for Boston (about the Boston Marathon), Philip Glass’ music for Jane (about scientist Jane Goodall), and Alex Heffes’ score for Earth: One Amazing Day (a great BBC film about a day in the life of the planet). 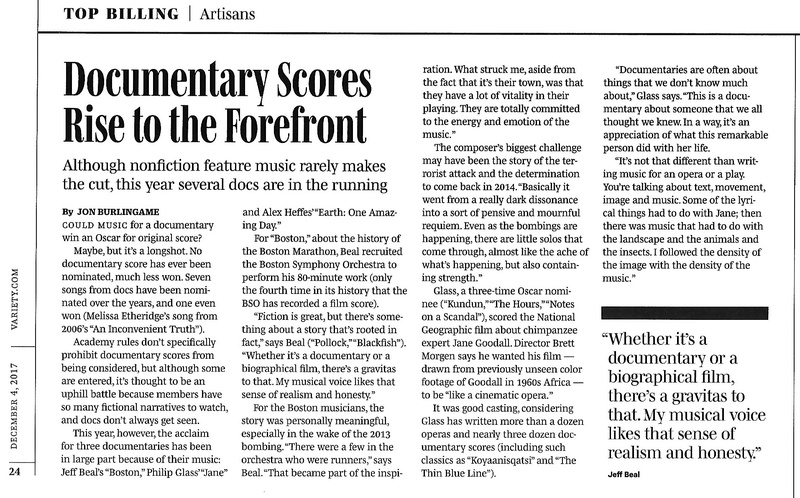 This entry was posted in Composers, Film Music, Interviews and tagged Alex Heffes, Boston, Boston Marathon, documentary scores, Earth: One Amazing Day, Jane, Jeff Beal, National Geographic's Jane, Philip Glass, Variety on December 4, 2017 by Jon Burlingame. 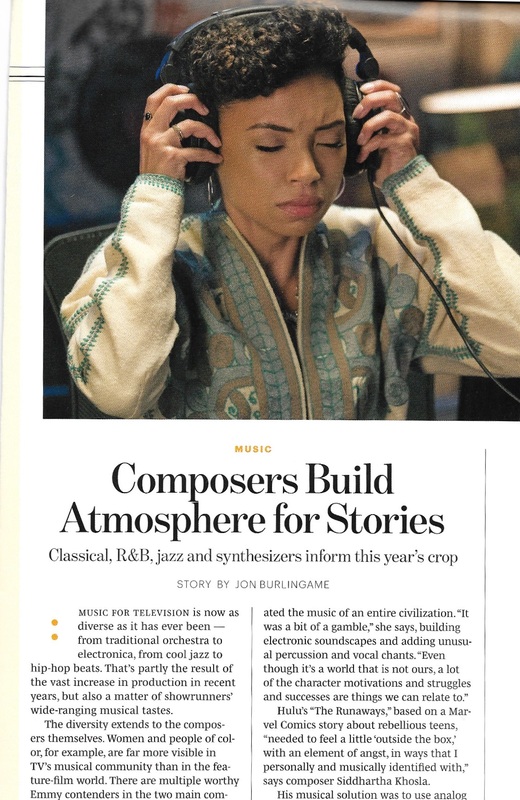 I love putting together Variety‘s annual chart examining all the nominees in Emmy’s various music categories, because it gives me a chance to talk with the composers about the musical and dramatic challenges they face. I assembled some of the best quotes from the six nominees in Emmy’s “music composition for a limited series, movie or special” category into a story for this week’s edition. Interviewed: James Newton Howard (All the Way), Martin Phipps (War & Peace), Victor Reyes (The Night Manager), Jeff Beal (Jesse Stone: Lost in Paradise), David Lawrence (Descendants) and Jeff Russo (Fargo) — all super-talented composers who deserve their nominations. And here is a story chronicling all of the Emmy winners (announced Sept. 10). 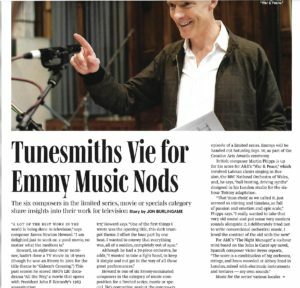 This entry was posted in Composers, Interviews, Television Music and tagged All the Way, David Lawrence, Descendants, Emmy music, Emmy nominations, Fargo, James Newton Howard, Jeff Beal, Jeff Russo, Jesse Stone: Lost in Paradise, Martin Phipps, The Night Manager, Variety, Victor Reyes, War & Peace on September 8, 2016 by Jon Burlingame. 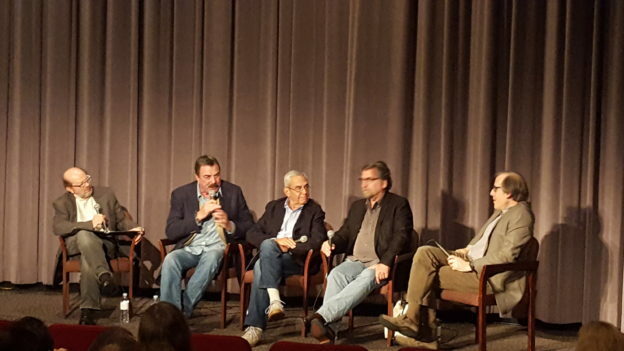 Thursday night at the Directors Guild of America, four collaborators on the Jesse Stone television movies joined me on stage after a screening of the latest Hallmark Channel movie, Jesse Stone: Lost in Paradise. The occasion was composer Jeff Beal’s Emmy nomination for Music Composition for a Limited Series, Movie or Special, and it was a treat to hear star Tom Selleck, director Robert Harmon and writer-producer Michael Brandman extol Beal’s music as a key component of the storytelling in all nine Jesse Stone movies. I was delighted to act as moderator and to find out, first-hand, that actor-writer-producer Selleck was as interested in the contribution of music as everyone else on that stage. This entry was posted in and tagged DGA, Emmy music, Hallmark Channel, Jeff Beal, Jesse Stone, Lost in Paradise, Michael Brandman, Robert Harmon, Society of Composers & Lyricists, Tom Selleck on August 20, 2016 by Jon Burlingame. For this season’s Emmy contenders issue, the editors at Variety posed an interesting question: When TV series run two, three, four or more seasons, how do the composers treat their characters and story arcs? Is it best to ground them in familiar musical territory, or should the scores reflect the changing, often expanding, storylines? 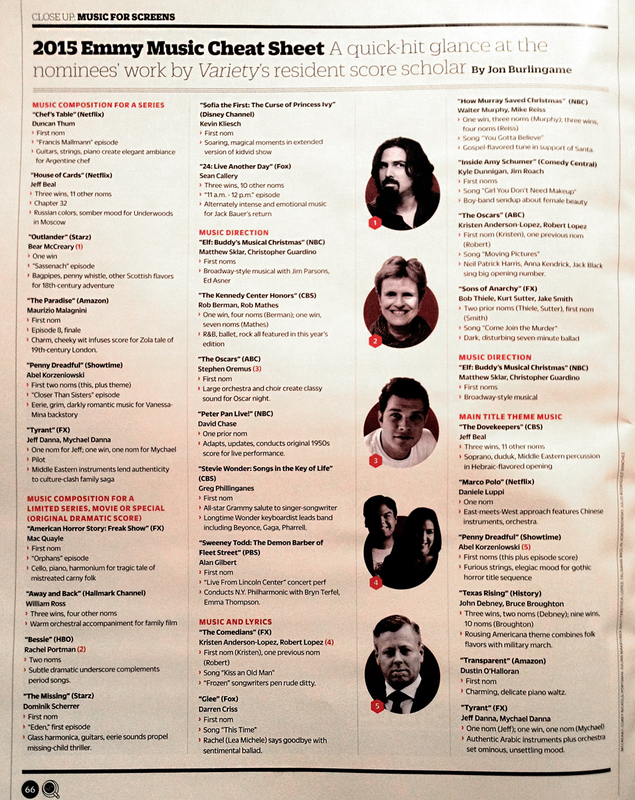 I interviewed a wide range of composers to find out how they handled the challenge: Bear McCreary (Outlander), Blake Neely (The Flash), Joey Newman (The Middle), Jeff Beal (House of Cards), Ramin Djawadi (Game of Thrones), John Lunn (Downton Abbey) and Sean Callery (Homeland). 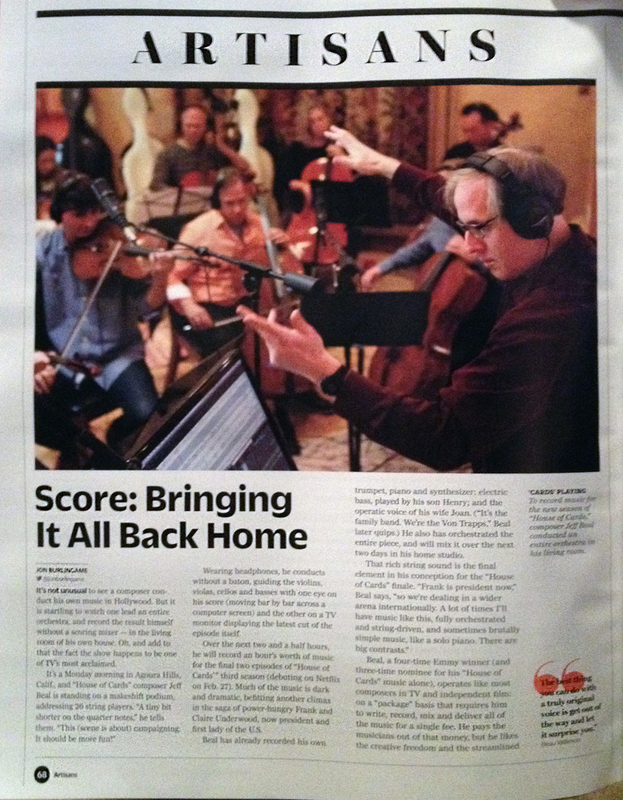 This entry was posted in Composers, Interviews, Television Music and tagged Bear McCreary, Blake Neely, Downton Abbey, Game of Thrones, Homeland, House of Cards, Jeff Beal, Joey Newman, John Lunn, Outlander, Ramin Djawadi, Sean Callery, The Flash, The Middle, Variety on May 31, 2016 by Jon Burlingame. One of my most challenging, but also fascinating, annual Variety assignments is looking at every nominee in all five Emmy music categories and finding something informative to say about each. (For example, Jeff Beal’s Hebraic-flavored theme for The Dovekeepers used a soprano, a duduk and Middle Eastern percussion). We then assemble a chart examining all 30 (including such details as their Emmy record, how many past wins or whether they’re a first-time nominee). 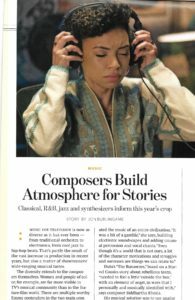 And the chart is featured at the Society of Composers & Lyricists’ annual Emmy reception, which is a source of pride for us at Variety. It never looks as good in the online version. 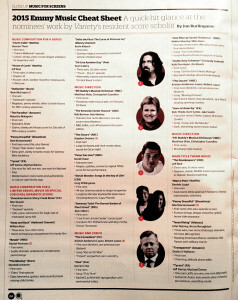 Here’s what it looks like in print. This entry was posted in Composers, Television Music and tagged Emmy Awards, Emmy music, Emmy nominations, Jeff Beal, Society of Composers & Lyricists, Television Academy, Variety on August 24, 2015 by Jon Burlingame. This entry was posted in Composers, Interviews, Television Music and tagged Beau Willimon, House of Cards, Jeff Beal, Monk, Rome, The Dovekeepers, Variety on February 25, 2015 by Jon Burlingame. This entry was posted in Composers, Television Music and tagged Alf Clausen, Bear McCreary, James S. Levine, Jeff Beal, John Lunn, Mark Snow, Mark Watters, Michael A. Levine, Ramin Djawadi, Sean Callery, Television Academy, Trevor Morris, TV Academy concert, Variety, Walter Murphy on February 24, 2014 by Jon Burlingame.